The average cost of memory care in Lake County is $4,258 per month. This is lower than the national median of $4,650. Cheaper nearby regions include Orange County with an average starting cost of $4,130. To help you with your search, browse the 9 reviews below for memory care facilities in Lake County. On average, consumers rate memory care in Lake County 4.0 out of 5 stars. Better rated regions include Sumter County with an average rating of 4.6 out of 5 stars. Caring.com has helped 11 families in Lake County find high-quality senior care. To speak with one of our Family Advisors about memory care options and costs in Lake County, call (855) 863-8283. Lake County is located near Orlando, in the central part of Florida. It has a population of 346,017, of which 26.5 percent, or 91,700, are 65 years of age or older, and many of them are likely to be living with Alzheimer's disease. In the state, the estimated number of dementia patients is expected to rise from 540,000 to 720,000 by 2025. Not every assisted living facility can watch over these patients. Florida law dictates that care for senior citizens who have cognitive impairments requires an Extended Congregate Care (ECC) license. In Lake County, 13 of these ECC facilities are scattered across the neighboring communities. Florida is one of the few states in the U.S. that does not have an income tax. This favors seniors and families on a fixed income who can take money that would have been spent on taxes and use it for healthcare costs in an ECC facility. Cost of living estimates are based on a national average of 100, and Lake County's cost of living is 93.8. Housing is a bit higher than the national average, but healthcare is a bit lower as well. The money saved by the lower healthcare expenses can be put toward housing or another bill. Crime is rated on a scale with one being the least amount and 100 representing the highest. For violent crime, the U.S. average is 31.1, while Lake County's ranking is 10 points higher at 41.5. Property crime in the U.S. averages 38.1, as compared to 42 in Lake County. Seniors can benefit from the additional security offered by an assisted living facility. Lake County receives an average of 53 inches of rainfall yearly, and the U.S. average is 39 inches. Lake County has 234 sunny days as opposed to 205 nationally. Summer highs climb to 92 degrees and slide back down to 45 in January. Sperling's ranks Lake County 77 out of 100 on its Comfort Index. Memory Care costs in Lake County start around $4,258 per month on average, while the nationwide average cost of memory care is $4,800 per month. It’s important to note that memory care rates in Lake County and the surrounding suburbs can vary widely based on factors such as location, the level of care needed, apartment size and the types of amenities offered at each community. Lake County and the surrounding area are home to numerous government agencies and non-profit organizations offering help for seniors searching for or currently residing in an assisted living community. These organizations can also provide assistance in a number of other eldercare services such as geriatric care management, elder law advice, estate planning, finding home care and health and wellness programs. To see a list of free memory care resources in Lake County, please visit our Assisted Living in Florida page. 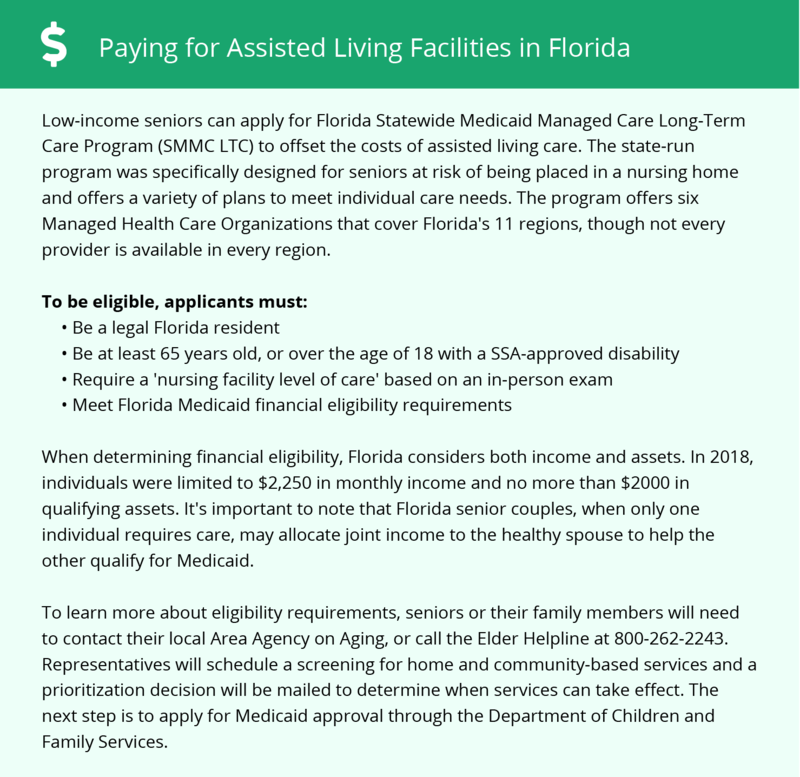 Lake County-area assisted living communities must adhere to the comprehensive set of state laws and regulations that all assisted living communities in Florida are required to follow. Visit our Memory Care in Florida page for more information about these laws.